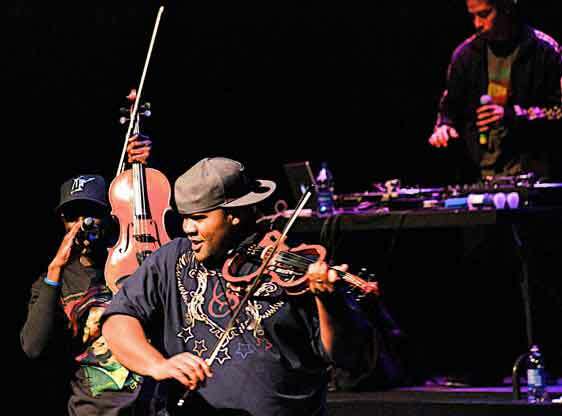 Black Violin plays to a sold-out audience at SHHS | LEARN TO PLAY THE VIOLIN FOR FREE! With all the hand clapping, arm waving and hollering going on Sunday night at Science Hill High School, Black Violin put on a performance with energy rarely seen during a strings concert. Combining classical training and hip hop beats, the musicians known as Black Violin produce their own blend of music that caught the attention of artists such as Alicia Keys, Jay Z and Kanye West.“This isn’t a concert. It’s a party,” said violinist Kev Marcus at the beginning of the show. Marcus and his counterpart, Wil B, encouraged the audience to get up and dance during the performance. Hosted by Umoja and CenturyLink, the concert Sunday was a fundraiser for both Umoja and the Johnson City Schools Orchestra. “I just thought it would be a fantastic opportunity for Johnson City, especially for our youth,” said Ralph Davis, chairperson of the Umoja Unity Committee.Davis and other members of Umoja worked for nearly two years to bring Black Violin to Johnson City after Davis heard the band perform on TV. “I just thought it would motivate a lot of our students to see that music is fun, and it can be exciting,” said Davis. In addition to raising money for the annual Umoja Festival taking place Aug. 12-13 this year in downtown Johnson City, the concert also helped fund the spring competition trip to Orlando, Fla., for the Johnson City Schools Orchestra. The two members of the group, violist Wil B and violinist Kev Marcus, visited Indian Trail Middle School Saturday to speak with about 75 music students. During the hour-long workshop, Wil and Kev told students how they started out playing music in their own school orchestras. “Basically they told the kids there’s no limit,” said Susan Lambert, orchestra director for Johnson City Schools. “You can do whatever you want as long as you work hard and stay focused on what you’re doing.” Lambert said both musicians ended up playing strings at a young age against their will. Kev was urged by his mother to play the violin, and Wil began when the school band ran out of saxophones and instead handed him a viola. “They started out by saying, ‘we didn’t want to play these instruments,’ then they just fell in love with it, and it’s just a part of them,” said Lambert.Lambert said she hopes Black Violin will return to Johnson City to spend more time with her students. The sold out show packed the Science Hill auditorium. Although the numbers had not yet been calculated, Lambert said the fundraiser was a significant help toward defraying the costs of the spring trip where the students in grades eight through 12 will perform at Walt Disney World. Additionally, it was a memorable experience for her students, who were able to see how timeless classical music can influence contemporary self-expression. via Black Violin plays to a sold-out audience at SHHS.